The Redemptorists » UPDATED: Pray for vocations..and for our novices! Congratulations to the novices who received the Redemptorist habit for the first time May 15. Nine men from the provinces of Baltimore, Denver, Edmonton-Toronto, and London were invested during a Mass Sunday at St. Patrick’s Church in Toronto, Canada. The year-long novitiate is a special time of prayer and reflection on Redemptorist spirituality and our charism, all in preparation for first profession of vows. 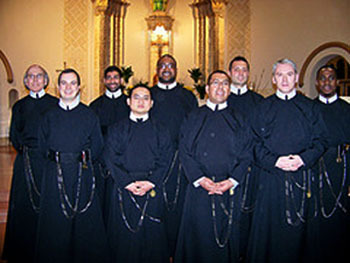 Two novices from the Baltimore Province and two novices from the English-speaking Region of the Caribbean are scheduled to profess their first vows as Redemptorists in August. Please keep all of them in your prayers, and pray that more young men will join us in our mission to the poor and most abandoned.